Posted by Denise Deby. Thanks to Julia Dupuis, Canadian Organic Growers for the information. What better time than the fall to upgrade your gardening skills? 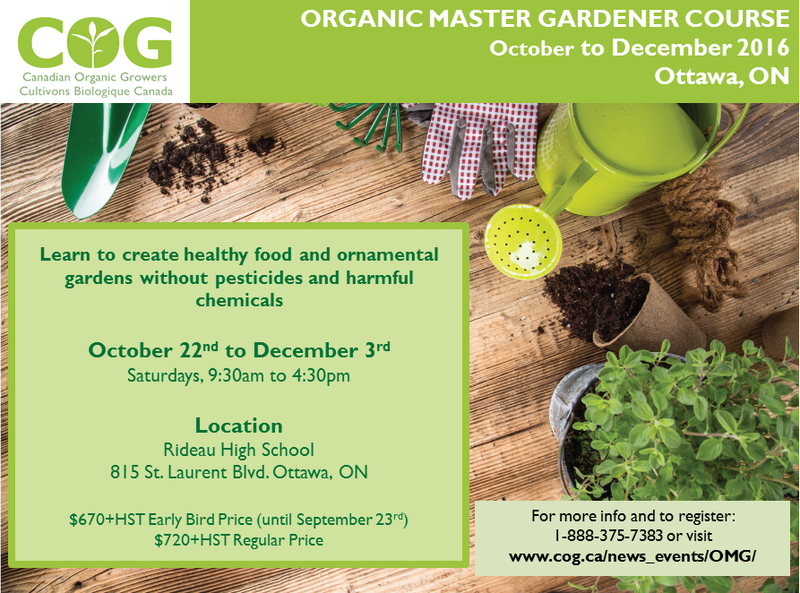 Canadian Organic Gardeners is once again hosting its Organic Master Gardener course, running Saturdays from October 22 to December 3, 2016. The course is for seasoned and new gardeners—really, anyone interested in and willing to invest in learning how to maintain a vegetable garden, container garden, ornamental garden, lawn or other patch of soil in an eco-friendly way, without pesticides or a lot of watering. The course helps understand the connections between soil, plant, human and environmental health, and shares practical knowledge such as plant selection, watering and composting. For details and to register, visit COG’s website, or email them at office[at]cog.ca or phone 888-375-7383.